Barack Obama has hailed the result of landmark elections in Myanmar, which look set to usher in a new government. Aung San Suu Kyi's National League for Democracy is on track for a majority, taking about 80% of declared seats. But a quarter of parliamentary seats are allocated to the military, meaning it will remain hugely influential. Mr Obama called Ms Suu Kyi to congratulate her and her party, saying he hoped the result would lead to "a more peaceful and prosperous future". While previous statements by British Prime Minister David Cameron and US Secretary of State John Kerry praised only the running of the election, Mr Obama directly acknowledged "the success of the National League for Democracy". He also praised what he called Ms Suu Kyi's "tireless efforts and sacrifice over so many years to promote a more inclusive, peaceful, and democratic Burma", referring to Myanmar's other name. Mr Obama, who has visited Myanmar twice during his presidency, said he hoped the official election results would be respected by all parties. Myanmar's military chief Min Aung Hlaing said the military would "do what is best in co-operation with the new government during the post-election period". President Thein Sein has also pledged that his government "will respect the people's decision and choice and will hand over power as scheduled". Elections explained: Why does this vote matter? 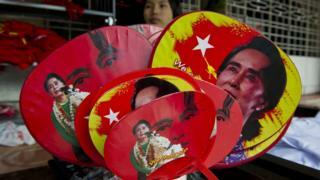 Last weekend's vote was Myanmar's first openly contested general election for 25 years. The NLD won elections decisively in 1990 - only for the result to be nullified and Ms Suu Kyi placed under long-term house arrest. President Thein Sein and Min Aung Hlaing have congratulated Ms Suu Kyi on her party's performance in the polls, though have not formally conceded defeat. They have agreed to hold talks on national reconciliation with her after the final results are announced. More than 47% of results have been declared so far, and on Thursday morning, the NLD were said to be 38 seats short of a majority. The ruling military-backed Union Solidarity Development Party (USDP) - which won the last, widely criticised election five years ago - has so far gained about 5% of the seats being contested. About 30 million people were eligible to vote and turnout was estimated at about 80%. However, hundreds of thousands of people - including the Muslim Rohingya minority, who are not recognised as citizens - were denied voting rights. A quarter of the 664 parliamentary seats are set aside for the army and a handful were not contested, leaving 491 seats. For the NLD to have the winning majority and be able to select the president, it will need at least two-thirds of those seats.